The iew Induktive Erwärmungsanlagen GmbH has specialized in the production and worldwide distribution of middle- and high frequency induction heating units using the latest transistor technology. Our induction heating units are mainly used by professional users at individual workstations. For industrial purposes we develop, design and build matching systems specifically to each customer’s requirements. On this website you will find product information regarding (e.g. brazing units and hardening units as well as technical data sheets. If you still need more information, we are looking forward to a personal conversation at any time! We develop, produce and distribute mobile and stationary induction heating units with a power range from 2kW to 25kW for contact-free heating of metals, among others, for brazing, hardening and shrinking. With our PLC control units you control the heating parameters (e.g. target temperature, holding time, etc.). Thereby up to 100 different programs can be stored. In this case it is possible to combine various programs, such as hardening and subsequent tempering in one sequence. Of course the specially programmed PLC sequential control from the iew GmbH can even realize complex brazing applications such as brazing under a protective gas with pre- and after flooding of nitrogen. To achieve an optimal heat input it is necessary to design an inductor precisely matched to the workpiece. The iew GmbH is able to realize every possible inductor geometry (through specially made CAD drawings), in coordination with our customers. These fit optimally to the relevant process in terms of efficiency and heating zone. 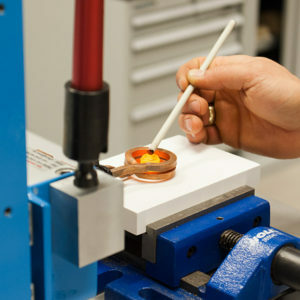 Through our inductor construction seminar we enable our customers to build their own inductors in the future, so a quick adjustment to component changes can be made possible. Design incl. CAD drawings and inductor production according to your wishes. Efficient water re-cooling systems ensure optimal cooling performance and safety in the workplace. Spot-on temperature control requires precise measurement- and control processes with non-contact infrared temperature control systems. We can provide you with the correct ceramic tools with which you can handle and manipulate glowing workpieces e.g. ceramic tweezers or technical ceramics for fixtures. We have a large stock of round and square profiles of copper, so that we can make custom-made products (e.g. inductors) in any dimensions for you.